The most common type of switch on a shotgun microphone is a filter. 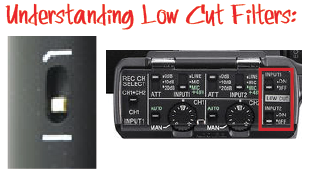 It is either called the “low cut” or “high pass” filter, they mean the same thing. Once activated, the filter will remove unwanted low frequencies from the audio. For example, low frequencies can come from microphone stand vibration, hum from a furnace, rumble of distant vehicles and sometimes wind noise. The line with the bend means that the low cut filter is activated.